The WaterRower Natural rowing machine is hand crafted in solid Ash and stained Honey Oak for consistency of color. Each rowing machine has been hand finished with Danish Oil giving a deep lustre and warmth to the wood. Wood has been chosen due to its marvellous engineering properties, primary amongst these is its ability to absorb sound and vibration enhancing the WaterRower's quiet and smooth operation. Ash, like all woods used in WaterRower rowing machine construction, is a premium hardwood with incredible longevity and dimensional stability. Generally good service, time frame for delivery longer than expected but equipment arrived in good condition and cost was good compared to local dealers. I don't regret buying this rower at all. It does its job and is made of quality materials. It's very simple to assemble and is lightweight so it's easy to move around and pack away. Would recommend. 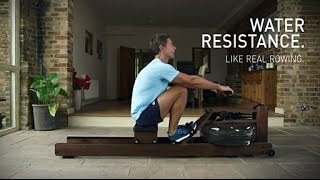 Great product, great support - thoroughly recommend both the Waterrower and Gym & Fitness.